June | 2016 | Educate.Empower. Out by Angela May George (Published by Scholastic Australia) is a sad yet heartwarming story about a young refugee girl who has settled in a new country with her mother. This beautiful story follows how the girls feels in her new home and the fears she still faces because of what she has been through. Owen Swan’s illustrations provide the gentle and moving touch needed to really allow the reader to feel like they are moving along with the girl and feeling what she is feeling. I shed a tear at the end of this story. This week is Refugee Week and really, we should always be thinking of the refugees that are in Australia and those who want to be in Australia. Many hold terrible memories like the young girl and her mother and need support to start fresh. I hope that you can share this story with others, showing the refugees are not the enemy but just like you and me. They too need love, support, friends and family. They too hold memories of fear and hope. So how can we embed this into the curriculum? Why are two people in colour on the front cover and the rest in black and white? Back Cover: What does it mean ‘ I’m called an asylum seeker but that’s not my name’ ? What does Brave mean to you? Have you ever felt like the girls running on page 2? Imagine feeling as isolated as the boat in the ocean scene. When do you feel free? What does feeling free mean to you? How does this differ from the girl in the story? Does this story have a happy ending? Older students could write a recount/ diary entry remembering a time when they felt fear – if they cannot recall an event they can imagine it. Find images of Refugees & asylum seekers. Link emotions to their faces. Dramatise different emotions linked to different situations in the story. Show a picture in the story and ask children to freeze an emotion. Write a persuasive letter to the government outlining why we need to accept Asylum seekers. Have a debate about asylum seekers in Australia. Look at the picture of the girl and mother huddled together on the boat – list how they are feeling. Think of a time you have felt like this. Which stories would you tell if you were on a very long journey without any technology? Can you find out about another language? Create your own simple welcome brochure for your own community. Link this book to other books (The happiest refugee by Anh Do, Mirror by Jeannie Baker) compare and contrast the different stories of these young children. Research statistics on the number of refugees in Australia. Compare this to other countries around the world. Find out where refugees have settled in Australia. Use tables to show this information. Why are people refugees? Find out the different reasons someone may be a refugee. What is a refugee? What is an asylum seeker? What is an immigrant? FInd out and compare differences. Discover different popular music from different lands. How do people enjoy this music. Compare and contrast the different music. How can we make our community more welcoming for those who are new to Australia? Could you catch a fish with just two simple materials such as a shoelace and a hook? Shoelace and a button? Think of as many combinations as you can from two objects that you have on you right now. Why do we have refugees in this world? Can we rid the world of needing to have refugees? Are there different types of refugees? What does it mean to be BRAVE? How can we be BRAVE? Do we need to be BRAVE? Join my email list today and receive free family and classroom friendly tips on how you can educate yourself and your children to live more sustainably. My monthly email will: spark ideas that assist you to help your child or students to become engaged readers. Empower yourself to be the best educator you can be. Engage your child and students in reading, learn new concepts about nature, global issues and imaginative play and then apply them at home or in the classroom! Email me to sign up – nes.ryan@bigpond.com. 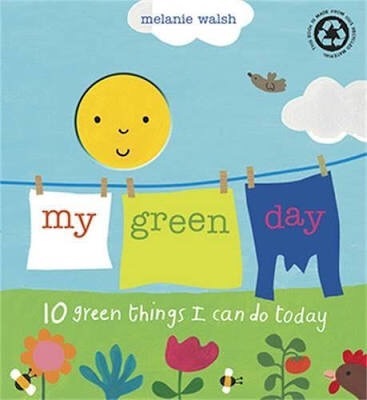 My Green Day by Melanie Walsh is a vibrant and fun book for readers of all ages to enjoy. With hidden pictures, flaps to lift and holes this picture book is not only an informative book but it is also fun! My Green Day outlines through picture, simple sentences and colourful illustrations how we can all try to be more environmentally friendly in our every day activities. These simple tips include having a compost bin at home, drying clothes on the clothes line, making presents rather than buying them and eating all of our food! Children will enjoy these tips and I am sure they will feel that it is something that they can do at home, quite simply. So how can we have more fun with this book? Write a persuasive argument about the importance of being more environmentally friendly, drawing ideas from the book. Persuade parents to buy a compost bin, have chickens or use the dryer less. What is a compost bin? How do they work? What is plastic? How is is made? Can it be reused or recycled? If we all threw out one apple a day, how many is that in a week? Two noodles of pasta? Half a piece of bread? etc. Look at your shopping list. Using fractions and percentages work out the fraction of recyclable materials in the packaging. Plastic materials. No material/no waste. How many litres come out of a tap/shower in thirty seconds? Work out how many litres each student uses per day after they record their times at home. Investigate how long it takes to break down different substances (in dirt, in a bin, in a compost bin, in sun etc) Relate this to what students do with their own waste. A forest by Marc Martin immediately captured my attention with the creatively painted forest on the front cover. The tiny trees that envelop the front cover , each one completely different from each other, have been drawn with water colours, texta, pencil and ink. A forest tells a story through simple words and captivating pictures about a forest being destroyed due to human greed but then growing again through human care. A true story of hope and empowerment. I loved reading this story to my children and they enjoyed listening and looking at the illustrations. It is a poignant story and one which helps to grow awareness of the importance of the natural world just outside out doorstep. It’s a brave story with tender words and memorable images. It’s a must read for anyone who loves a good picture book with a message of hope. So, how can we have fun with this story before, during and after we have read it? Tell the story without any words – ask your child or class to tell their own story. Storytelling is a timeless art, increases vocabulary and imagination and is a lot of fun. Children can see the story how they wish to see it. Give it a go. Make tree patterns, not only learning about different types of patterns but also exploring different types of trees around the school or neighbourhood! Measure different tress that are in the school grounds or the local park. This could even be monitored over the year to see how they all grow differently. How many different types of trees are in the local area? Create different data displays. Create your own forest – perhaps an Australian version (rainforest, eucalyptus forest, mangrove, melaluca etc) . Or create your own city – research cities of Australia and the world. Look at the lines used in the buildings and recreate your own using texta. Compare the differences between the two groups of people portrayed in this story. Link this to people who are in our world. Try to walk in both shoes and work out why people make these decisions and why they think they are doing the right thing OR even why people do things even though they know they are being destructive to the natural world or other people. OI.8 Designing action for sustainability requires an evaluation of past practices, the assessment of scientific and technological developments, and balanced judgements based on projected future economic, social and environmental impacts. A patch from Scratch written by Megan Forward. This book reminds me of my own little family and I am sure many other families who live in the suburbs of large cities! We have had lots of fun (and still do) in our backyard thinking of ways that we can make our yard a mini farm. We have chickens, compost bin, worm farm and a veggie patch and although it is a bit of work to maintain it is a great reward to have our own eggs and vegetables right in our own backyard. A patch from scratch is written from the perspective of a young child, which I think really empowers young readers to think – how can I do this in my own backyard? The illustrations show how the family make the different items needed for their own backyard farm and offer some simple tips throughout. This is a cleverly written book, giving readers insight into how they can create their own veggie patches, chicken coops and compost bins. It shows that growing your own food can be fun and rewarding without being too much hard work. But what about those who live in apartments? Children who live in these places may feel like they cannot connect to this book – but they can! Many suburbs now have community gardens so search your area for one. Your child’s school or daycare may also have a small patch that they can be a part of. There are many mini compost bins you can buy that can sit on balconies and mini herb patches where you can grow your own herbs. Be creative, getting in touch with dirt and plant growth is vital so that young people understand where food comes from – not just a supermarket! This is a great book, and one that we have enjoyed reading over. We have spent time looking at the illustrations as we have read the words and noticed the fun the family in the story are having. A great read that can be enjoyed by the whole family! So what can you do to link this book to the curriculum? Find out about the life cycle of a chicken. Extend this into other animals that we eat and other animals that we eat the produce of. Can you compare two of these animals? To extend research how different countries harvest honey, what they feed their cows or how they eat different meat. Can all plants grow in your area? Research which plants grow best in your area. When to plant them and where they grow best in the garden. Research Australian stingless bees. Where do they live? How do they collect honey? How do they move about? Compare the different types of stingless bees in Australia. Find out why their hive is designed the way it is. Imagine you are in charge of creating a new patch for your backyard. You may have a little bit of magic up your sleeve – how can this help you to grow delicious food and perhaps some food that hasn’t been eaten in years (due to it’s unpopularity) Link here to look at heirloom seeds and the Diggers club. Write a report about how to grow a vegetable or fruit of choice. Create your own plant diary like the child did in the story. Grow a seed of choice and record how it grows in different locations and with different amounts of sun, water and love. Give students a designated backyard space in which they need to design their own sustainable backyard. They can be given budgets, time constraints and must have items. Work out which plants and how many can grow in a designated area. Different vegetables and fruits need space so work this out and then apply to a patch of dirt. One less fish is a colourful, informative and pertinent story about the Great Barrier Reef and the amazing sea creatures within. I’m sure many of you are aware of the coral bleaching that has been occurring in the GBR over the past year. The coral reef is such an important part of our natural world and more importance needs to be placed upon this destruction. I have been lucky enough to visit the reef, see the vibrant coral and swim amongst the different sea creatures that live there. Many people will miss out on this opportunity if we don’t start to take action. The picture book One Less Fish by Kim Michelle Toft and Allan Sheather allows children to see the fish that swim amongst the coral. The beautiful illustrations show the diversity that swims in the Great Barrier Reef and highlights the beauty of the coral that the fish live between. One Less Fish was written to show readers what may have happened if it had not been inscribed on the World Heritage List in 1981. Each page gives tips on how we can start to make changes so that less destruction takes place towards to Reef, the ocean and the sea creatures. Although this book seems sad and without hope as fish diminish one by one it ends on a high with all of the fish returning. One Less Fish is a great teaching resource through the tips on each page and the glossary on the last two pages. It also allows children to see what sorts of fish live in the Great Barrier Reef and allows them to hear what can happen through small less thoughtful actions. It also is a great starting point to discuss with them what we can do today, to ensure there is less harm done. When I read this story to my children they loved counting the fish, talking about the different colours in each image and finding out the names of the creatures. Allow time to research a fish or another sea creature that lives in the Great Barrier Reef. Find out as much as possible about that creature. Ask the question – how will they be effected by coral bleaching? Find up to date information about the Great Barrier Reef: How it is used, who uses it and the governments approach to it. Create a Venn diagram that compares two animals of the Great Barrier Reef. Find out the life cycles of the different types of GBR fish. You will be amazed at how different they are! Forming small groups look at the different tips that are offered on each page – research these issues to gain more understanding of them. Are they still issues? Are there more issues since this book was written in 1997? Count the fish as you go. Show addition and take away sums as you read through the story. How many fish are there in the whole story? How many years has the reef been listed on the World Heritage List? Look at temperature charts of the sea water over the last ten years. Discuss how this effects the coral. Do people think differently now than in 1997? Have we continued to protect the reef? What can we do if we live far away from the reef?